Henrik Ibsen’s 1882 drama An Enemy of the People seems freakishly prescient in an era when politicians abandon all pretence of truth as a basis for decision-making, preferring to serve black-magic ideologies and special-interest groups (no doubt on promises of post-politics pay-backs). About a whistle-blower whose exposure of dangerously contaminated water so threatens the viability of the town’s businesses that assassinating the whistle-blower’s character and dismissing the health consequences seem like good ideas, the work foresees the current demonization of scientists by the lunar right. 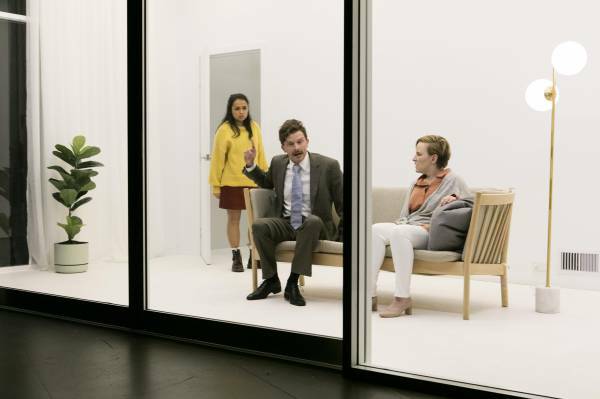 This adaptation by Melissa Reeves, directed by Anne-Louise Sarks, assumes we might all be too thick to catch the parallels, so has been shifted through time and space to 2018 Australia, with the whistle-blower, Dr Stockman, now a woman (played by Kate Mulvany). So far, so good. But Ibsen was actually quite a gifted writer – something that apparently came as news to Reeves, who says in a program note: “Until embarking on this practical journey of adaptation, I hadn’t quite realised how great plays from the past are these incredibly condensed pieces of human experience”. Hello? Is that not precisely why they are great plays? Or, in this case, was a great play. Because, while Reeves has maintained the pertinence of Ibsen’s subject matter, she has managed to shelve most of the enthralling nuance with which the main characters are established in the original – at a stroke making them less interesting, less complex, less conflicted, less likable and rather cartoonish. This freshly-imposed shallowness is encapsulated with the dialogue being carpet-bombed with the f-word to an extent that almost makes the lines of dialogue interchangeable between characters. Here’s an idea: put the cast behind glass! Brilliant! Photo: Brett Boardman. This is not to say it’s all dire. Reeves has contrived a genuinely amusing scene in which Stockman is being photographed for the local rag by Billing (Charles Wu) under the watchful direction of the editor, Hovstad (Steve Le Marquand), and we are allowed a brief flash of Mulvany’s undisputed acting gifts. But for most of the time that gift is reduced to finger-pointing and shouting. 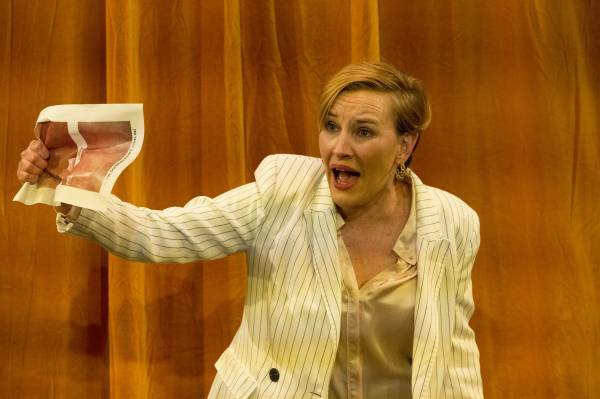 With her spouse written out of the play, Stockman’s relationship with her brother the mayor (Leon Ford) – always the work’s key relationship, anyway – spends more time in the foreground, and yet is infinitely less subtle than Ibsen’s version, reducing vital arguments to crass sibling squabbles. Even worse is that Mel Page’s set places much of the action within a glassed-in area representing Stockman’s living room, so we hear a tinny rendering of the dialogue via microphones. The upshot is that a crucial second-half confrontation between sister and brother – one that the writer, director, Mulvany and Ford potentially had working well – is made remote and vastly less affecting. The trimmed cast is completed by Peter Carroll (Morten Kiil), Nikita Waldron (a feisty Petra), Kenneth Moraleda (Aslaksen) and, in a new role of Reeves’ devising, Catherine Davies as Randine. Randine serves partly as a chorus to guide us, the slow-witted audience, in how we’re supposed to think; partly to thicken the conflict with a little class warfare. Reeves has also reinvented the ending, so that the original Stockman’s ideal of bravely standing alone becomes the new Stockman’s ideal of bravely standing together. I think we got that without writing it in neon. But then that sums up all that is wrong with this production: no lightness of touch: the writing, directing, design and acting all laboured almost from beginning to end. Poor Ibsen.